It’s a new year and you’d like to think that your users are getting smarter about clicking on phishing links, and not fall for recycled tricks by cyber criminals. Unfortunately, there is a new attack this week that’s been used before and people are falling for it in droves. 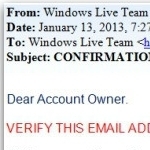 This is the attack, an email which claims to come from the “Windows Live Team” and warns Hotmail/MSN users that their account is at risk of immediate closure after different computers logged into it, and multiple attempts were made to guess the password. Yeah. That is nothing new and they will spam evrybody on your Contact list. Usually changing passwords will take care of it. Hey Ron, Probably so. It happens a lot. Usually just changing your password is enough. I may be thick as a brick but even i wouldn't fall for that one. looks like someone hi-jacked my e-mail. 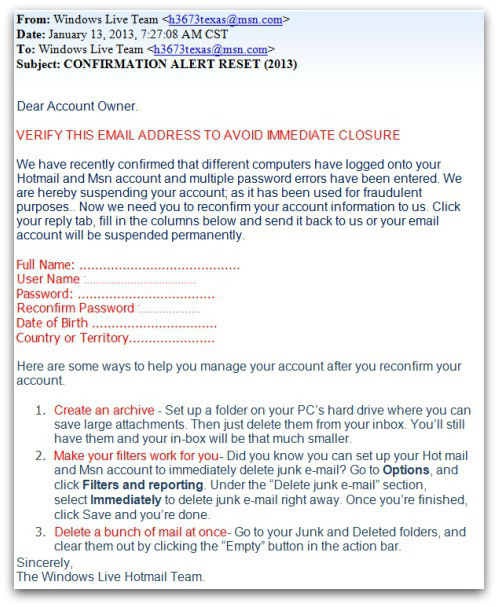 Do you seriously think that e-mail looks legit? Or that it is “official-looking” due to the msn address? This one came through my hotmail and it was someone from the NIH–National Institute of Health and I thought what the heck? Promptly reported it as a phishing scam. So, to whom does one report this kind of stuff to?